We've once again decided to help the Ely Hero Awards with our video expertise. Want to know why, read on? 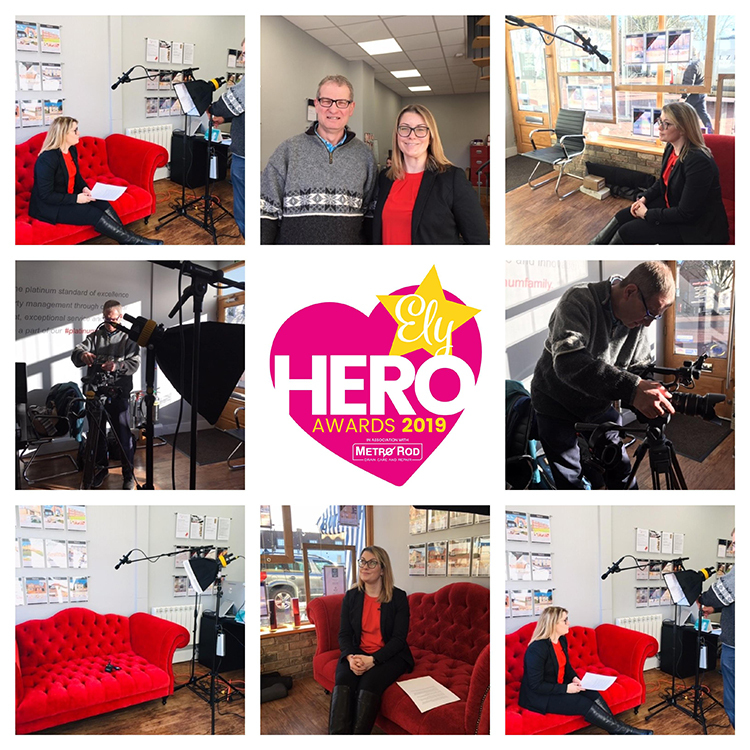 Last year we were asked to help promote the Ely Hero Awards by using video to promote the event on social media and encourage nominations for each category. Our resulting videos, see one of them below, was very successful, especially on Facebook and twitter - more info and stats here. Consequently, we did not hesitate to again offer our help with the 2019 Ely Hero Awards. As before, 6 people are being filmed (a range selected from sponsors, last year's award winners and judges) ahead of the launch on March 4th at The Poet's House Hotel in Ely - so that the launch video is edited and ready for it's first showing on the night. There will also be a number of other videos for 'drip feeding' into the Ely Hero Award social media channels from the launch date onwards. Filming started last week and Naomi (who runs Ely Hero Awards) got some quick phone shots of me setting up to film one of the sponsors. So, why do I get involved in this kind of thing? Mainly, because it's a way of giving back to the local community in the city we've made our home since the 1980s and love. It indirectly helps raise awareness of my business/what I do helping them use video. If this leads to paid work in the Ely area then that'll be a bonus. Note: I do the work for Ely Hero Awards completely gratis - but I have to run a business and pay bills so there is only so much I'm able and willing to do without reimbursement! As many of you know, I already devote an enormous amount of time and expertise in video production to the Magpas Air Ambulance charity as I'm their official video sponsor. Anyway, watch this space for the new Ely Hero Awards 2019 launch video coming in March.